Dietitians are urging parents to serve their children after-school snacks consisting of healthy staples that are typically unable to be taken to school, to make up for lost nutrients. The Dietitians Association of Australia (DAA), the peak body for dietitians, says Australian data suggests children are not meeting their quota for certain vitamins and minerals, putting their growth and development at risk – but wise choices after school can help combat this shortfall. According to the Australian Dietary Guidelines, children need to eat more vegetables, fruit, wholegrain cereals and low-fat milk, yoghurt and cheese. -Fuelling growing bodies can be a challenge at the best of times, let alone with the complexity added by finding foods suitable for school. -Most parents will be all too familiar with fruit squashed at the bottom of bags, yoghurt needing to be kept cool, and nuts not being allowed at school (despite being a great source of fibre, energy, good fats, vitamins and minerals). So at home, get creative with the very foods that prove difficult to pack into a lunchbox,' said Ms Murray, an Accredited Practising Dietitian. -Getting enough of the right nutrients is critical for learning, normal growth and development and for daily activities such as walking between classes or playing at lunch and recess. Sport and hobbies require additional energy and nutrients on top of this,' said Ms Murray. She said planning meals, including snacks, before the weekly shop helps make sure the right foods are on hand. 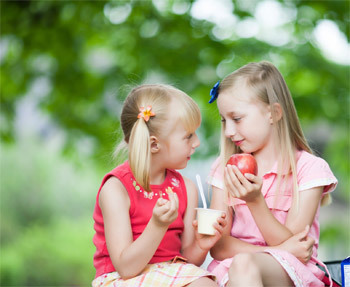 For individual nutrition advice for children and adolescents, taking into account growth and development as well as any extracurricular activities, DAA recommends seeking the advice of an Accredited Practising Dietitian.